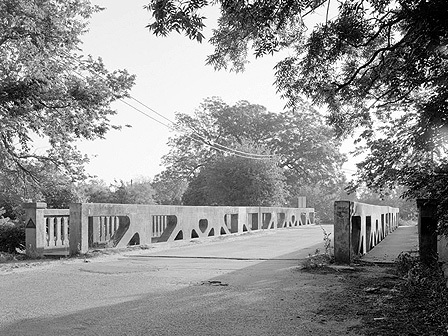 The Broad Street Bridge in Mason, spanning Comanche Creek, is the only reinforced concrete truss bridge in Texas and is one of a small number of known examples in the United States. The 102-foot long bridge is composed of two truss spans, each measuring 51 feet in length and supported by concrete abutments and one intermediate pier. The Alamo Construction Company of San Antonio constructed the bridge in 1918 as a reliable means of crossing Comanche Creek, which separated north and south Mason. The bridge, slated for replacement by the Texas Department of Transportation (TXDOT), is threatened because funds to save and rehab the structure into a pedestrian bridge were to come from federal enhancement funds that were recently cancelled by TXDOT.